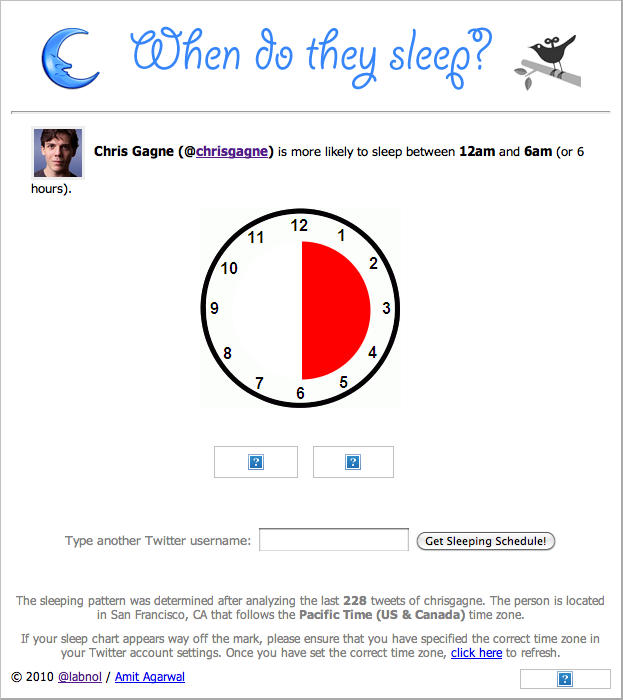 I first learned about “When Do They Sleep,” a project from Amit Agarwal (http://labnol.org, @labnol) at MozCon 2012. 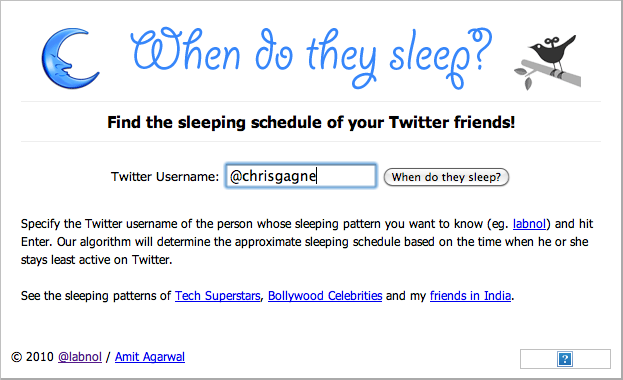 The suggestion was to identify when your target blogger slept so that you could tweet to them at a time they were most likely to be awake. I like the tool and it seems relatively accurate, at least based on my tweeting patterns. I just have one minor suggestion… strip leading @s from the user name. Sure, the user should “know better.” But sometimes we haven’t had enough coffee and this is a very simple fix that might improve the experience for a few more users. Take a look at open-source software. It’s collaborative, usually high-quality, and responsive to people’s wants and needs. Apache and Linux, for instance, are two prime examples of how people coming together can do quite a bit in the world, even if in a limited way. Other fields of pursuit have an opportunity to capitalize the lessons learned in the software industry. Applying some of these lessons to the nonprofit sector could result in a greater net impact for society. 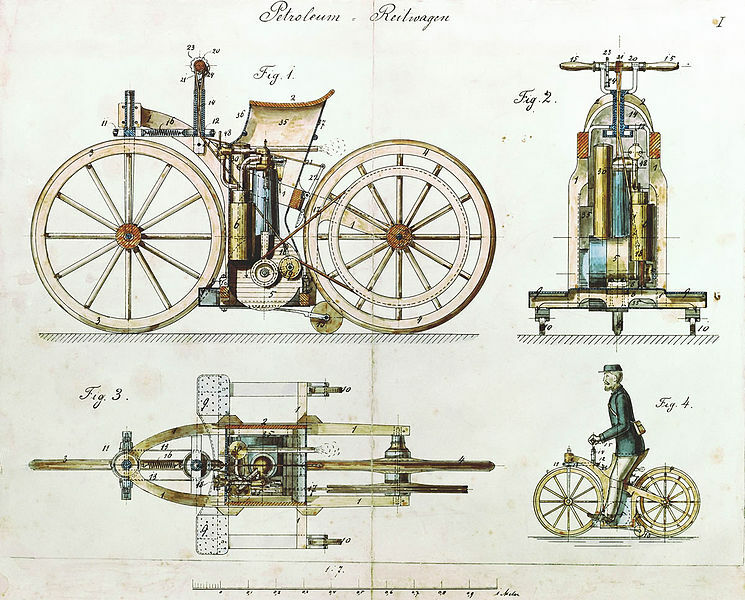 It is possible to apply ingenuity to hundreds of real-world problems if we have a collaborative organizational structure. We’ve seen a couple of examples. For instance, look at http://openprosthetics.org/. This group has applied the open-source model to design better prosthetics, and a few of their prototypes are better than anything currently available on the market. In December of ’03, I read an article in the New York Times about the World Bank Development Marketplace. A group of farmers in Zimbabwe struggled with a herd of elephants trampling their crops. With a $108,000 grant from the bank, they discovered that planting chili peppers around their crops deterred the elephants and provided a valuable cash crop. I asked a friend, Sandy, what she would do to prevent elephants from eating her crops. Pulling from her childhood experience, she suggested without coaching that the farmers plant marigolds around their crops. After all, marigolds kept the deer out of her vegetable patch! Perhaps marigolds would not deter an elephant. Suppose, then, that Sandy were a member of an online group hosted by Usenet newsgroups, Yahoo! Groups, or Google Groups, seeking a solution to the elephant problem. I am certain that she would have made a similar suggestion, and that the group probably would have recognized both its strengths and weaknesses. There is no guarantee, however, that this group would include the botanist, zoologist, or ecologist necessary to explore this seed of an idea. Over the last three years, I’ve developed a site called Cerbumi.org (“to brainstorm” in Esperanto) that combine these two tools. A carefully-designed mailing list system allows for rapid real-time discussion and brainstorming, while a flexible membership database allows project facilitators and other members to find expert advice. Built-in reputation-scoring and availability tools allow members to dictate clearly how willing they are to respond to certain kinds of inquires, and to whom. An executive summary is located at http://about.cerbumi.org/executiveSummary, and a Flash-based demonstration is located at http://cerbumi.org/flash/. What are your thoughts? Do you think this is a useful tool? Would you be willing to spend a few minutes of your time working on various projects?